Since he first emerged with his debut album in 1971, John Prine has been an acclaimed and respected singer/songwriter who has influenced many artists in the folk, country and Americana genres. He has won two Grammy awards and he’s been inducted into the Nashville Songwriters Hall of Fame. His album, John Prine, is recognized as part of the Grammy Hall of Fame. In addition, he has received the Lifetime Achievement Award for Songwriting at the Americana Music Honors & Awards. Prine has recently released his book titled Beyond Words, which is a special collection of his lyrics, personal photos, notes and memories that provide an excellent overview of his best songs and albums. Prine has selected 65 of his most popular songs to feature in this book. 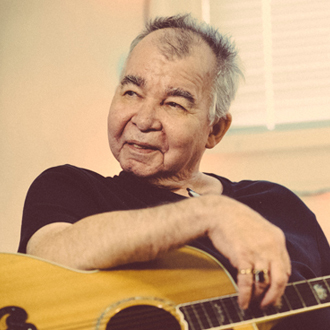 We are pleased to do this new Q&A interview with John Prine. But before we start the interview, here’s a list of the studio albums that Prine has released: John Prine (1971); Diamonds in the Rough (1972); Sweet Revenge (1973); Common Sense (1975); Bruised Orange (1978); Pink Cadillac (1979); Storm Windows (1980); Aimless Love (1984); German Afternoons (1986); The Missing Years (1991); A John Prine Christmas (1993); Lost Dogs and Mixed Blessings (1995); In Spite of Ourselves (1999); Souvenirs (2000); Fair & Square (2005); Standard Songs for Average People (with Mac Wiseman, 2007); Singing Mailman Delivers (2011); and For Better or Worse (2016). For the first decade of his career, Prine was signed to Atlantic Records and other major labels. Then in 1984, he was one of the first singer/songwriters to launch his own label, Oh Boy Records. Since 1984, Prine has released his albums on Oh Boy Records. Prine’s music publishing company is administered by Wixen Music Publishing. DK: I like your new book Beyond Words—it’s a great overview of your songs and lyrics. How did you select the songs for the book? John Prine: First of all I included the ones I usually do every night, which is a list that keeps growing. When we put a new record out, it’s tough to get all the new songs into a set because I can’t drop any of the classics. So we did those first, and then I put some personal favorites of mine that I wanted in there. Then I just kind of willy-nilly sort of whatever I was thinking of stuck it in there and I figured there is always volume two if need be. 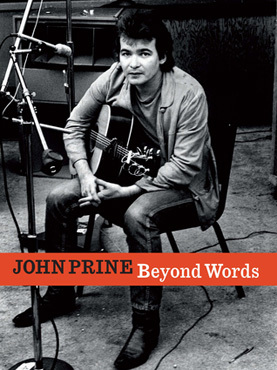 The cover of John Prine’s book, Beyond Words. DK: The book has many personal photos and lyric notes. What was it like, to go through your personal collection to create this book? Prine: I went through it while we were putting the book together, I went through it one page at a time. And when the book was published and they sent me a copy to look at, the very first time I looked at it, it was really too emotional for me to go through the whole book. I never saw all those pictures together, that clear, and in that big space and that’s how personal the pictures were to me just, I had to stop turning the pages for a while and I had to wait a few more weeks before I could actually sit down and enjoy the book. DK: Your first album, John Prine, includes many songs that have become classics. Did you write these songs over a period of several years, prior to recording your album? Prine: [It was a] shorter period of time. In less than a year I wrote songs for the first album, and I still had a couple left over that went on the second record that I wrote all in that one batch. But looking back, for me at least, I think the guy that wrote those songs, all the sudden from being a mailman overnight to singing one night a week in a club. Then that just went into singing once a week in a club and making more cash in my pocket than I’d ever seen before. That changes you, and you can change for the better or the worse, but it does change you. And the guy who wrote those songs on John Prine the debut album, he’s not around no more…I know him but he’s a different guy. There’s a lot of innocence on that first album that led to those songs, and once you lose that innocence you can’t get it back. DK: “Hello In There” is a beautiful, sensitive song. What inspired you to write from an older person’s perspective? Prine: Well I considered myself a writer, I thought I could write from any point of view I wanted to. Same thing with “Angel From Montgomery,” I mean how many guys would start out a song with “I’m an old woman”? DK: I’ve always liked your song, “Dear Abby,” which has great humor. How did you decide to write a song about the Dear Abby column? Prine: I was in Rome, Italy with my first wife, and we were just visiting. I was doing press over in England, and we had a week off so we dropped down to Rome. I think we went over to the Vatican, she was a Catholic, and we went over to the Vatican and we stayed over right by the Spanish Stairs. And the only newspaper, I’m a big newspaper freak, the only newspaper over there was The World Herald Tribune, and they didn’t have no comics, or crossword puzzles. The whole thing was news, mostly bad news. No sports, but they had “Dear Abby”…it was the only relief in the whole newspaper and I thought that deserves a song, so I just sat down and I wrote that song in probably less time it takes to sing it. DK: I like your album, Aimless Love, particularly your songs “People Puttin’ People Down,” “Aimless Love” and “The Oldest Baby in the World.” Can you tell me about writing the songs for this album? DK: In 1984, you were one of the first singer/songwriters to start your own label, Oh Boy Records. Is that a good path you would recommend for artists who are more independent? Prine: Definitely! When we started it, it was so unheard of, that people thought I was shooting myself in the foot by turning down major label offers, but I wasn’t. The only thing I did love was going out on the road; I loved playing for people and I loved writing songs, but I didn’t love working. Now more than ever, because of the internet, and also as a writer, it’s important to know that you own your own stuff. The major labels are basically there for high finance loans—you could go to a bank and do the same thing for less money and put a loan behind your career instead of a major label throwing parties for you and charging you, and giving you the ticket and not asking what you want to eat. DK: Your album The Missing Years was a Grammy winner (for Best Contemporary Folk Album), and it had terrific songs and excellent production by Howie Epstein. Can you talk about the making of this album? Prine: OK, in the late ‘80s I had an offer from Sony, they wanted me to come and record for them. I had already put two records out on Oh Boy. Anyway, it gave me pause; I had to think about it, you know because I was turning down a big contract, and they are such a well known outfit, and I happened to go to L.A. around Grammy time. I wasn’t there for the Grammys, I just happened to be there, that’s where my manager was still living. And we bumped into some friends from Sony, and they asked it we wanted to go to a Sony Grammy party, so I stopped in. Walter Yetnikoff was the president then, and he was sitting there, and a bunch of guys from Sony, vice presidents and A&R guys were sitting with him, and they all stand up because they heard I was signing with the label, and one guy slapped me on the back and said, “Welcome aboard.” And I turned to my manager, Al Bunetta, and said, “I don’t want to be on the same boat as any of those guys.” So I decided not to sign with them, and I’m glad I didn’t. Basically what I am saying is, by not signing with Sony we knew it was time to kick up the ante a little bit—make a record that really competed with the major label, rather than just making a self-serving record for my audience. So we really knuckled down with The Missing Years and lucked out getting Howie Epstein to produce it, and Howie was very careful with everything. We built that record one instrument at a time and it took over a year to do the thing. Which was good because I only had about a half a dozen songs when I went into the studio, so I was writing as we were making the record and I was really happy with how it turned out. That record did a lot for us besides win a Grammy—it put me back out in the running. I was doing fine; all I cared about was serving my audience and making sure they got the records. DK: You’ve been a successful and admired singer/songwriter for over 40 years. Do you have any tips or advice you would give to young songwriters & artists? Prine: Don’t give away your publishing! Hang onto it as tight as you can. God only knows who owns my first album. So I go to the movies and hear my songs, I get paid for it, but nobody tells me…They could at least drop me a postcard and tell me what they are doing with my stuff. In other words, I was the only person in that room when that song was written, and they shouldn’t have the right to do whatever they want with it.